Why do some artists become household words and others linger in obscurity? Some months back I wrote about the intriguing but now little known American painter Elizabeth Sparhawk-Jones (1885- 1968. You can read about Sparhawk-Jones on my friend Barbara Lehman Smith's website). Sadly Sparhawk-Jones' ascent in the art world was derailed for decades by her struggle with mental illness. Once considered one of the people to watch in the art world, her reputation is only now coming back out into the daylight. The far better known Georgia O'Keeffe (1887- 1986) came to prominence a few years later than Sparhawk-Jones when O'Keeffe became romantically involved with the older wealthy American photographer Alfred Stieglitz. Stieglitz was prominent in modern art circles and had the financial resources to champion her work. I've often wondered if we today would know O'Keffe's work as well had she not become entangled with the famous older photographer. Personally I think her work strong enough to have earned at least some audience for itself entirely on its own merits. But whether she'd be the superstar she is today without the Stieglitz boost we'll never know. Best known are her close up views of flowers, but she was also a first rate landscape painter. O'Keeffe forms an intriguing bridge between modernism and the traditions of realist painting. Her paintings are fascinating teachers who helped many to see nature with new eyes. 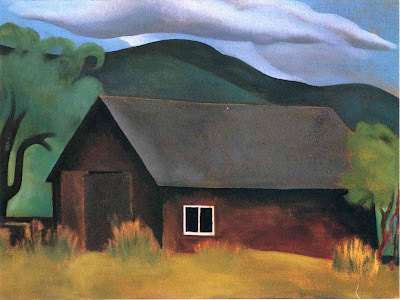 Above is one of her long series of works done up on Stieglitz's home up at Lake George at the southern edge of the Adirondack Mountains, as is the barn painting below. Look in the top painting at the huge role played by gradation of tone and color. I love the subtle difference between the slightly warmer colored sky and the ever so slightly cooler water. In O'Keeffe's barn painting there is a wonderfully managed collision between a natural world rendered entirely with softly undulating curved lines and the sharp and straight lines of the barn's geometry. O"Keeffe wasn't afraid to hit a harsh note to pump up the drama in her work. Look at the super high contrast in the barn's black window and its stark white frame. Test out how the painting would look without it by blocking it out from your view with your index finger. The painting becomes infinitely less powerful and energetic without it. Below is a painting from the Georgia O'Keeffe Museum in Santa Fe, NM where my friend Barbara Buhler Lynes is Curator. 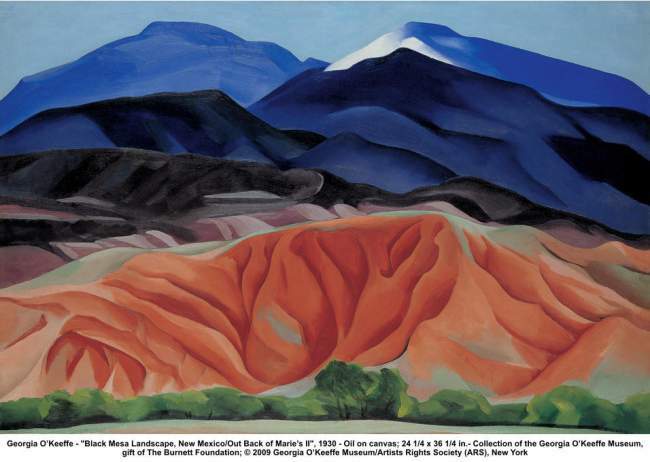 In a painting like this O'Keefe is taking a few hearty strides away from the colors she probably perceived when looking at the terrain around her. Color instead is chosen more for how she feels it will perform in her painting. As different as this mountain panorama below is from the barn painting above, notice one key similarity- the white patch of snow at peak at the right. It's so like the barn window, a fresh hand clap of an accent to wake you up just when you thought you had grasped the image's meaning. It's funny as in our time most discussions of paintings tend to center on color harmonies and dissonances. 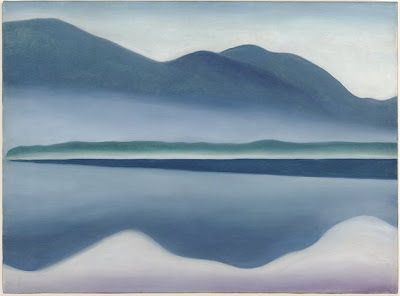 O'Keeffe, thorough going a modernist as she is, was more than ready to use tonalities of darks and lights to compose the drama of her compositions. As I've said before on this blog, the enjoyment of color is a least as much about the tones hidden in the colors as it is about the choice of a particular hue. My eye certainly has enjoyed the benefit of studying O'Keeffe's landscapes. She's one of the people who have by example encouraged me to become more playful in my own paintings with my color choices. Below is a new painting I finished just last week that displays some of those good lessons. It's titled Edward Hopper's Studio Bedroom, oil on panel, 10 x 5", 2011. The piece actually began several years ago when I set my easel up in the kitchen of Hopper's studio in S. Truro, MA on Cape Cod. It looks from the kitchen towards the two closet doors in the Hopper's bedroom that in real life have marvelous over sized black metal doorknobs. I first did a monochrome vine charcoal version. That in turn led to a pastel drawing of the same subject done working from the charcoal. And now this oil painting that I made looking at the pastel. My guess is that O'Keeffe too had an indirect working process like this, though I haven't researched her actual painting methods. I'll be at the foot of those mountains in a day. Sigh. Heading to NM for a 3 month sojourn with 14 Vermont college students. The mountains you show are now charred from the recent Las Concha fire. The largest ever in NM. Heart breaking and bizarre. Love the blues and oranges in your Edward Hopper's studio Bedroom Painting. Thanks for sharing. BTW I live about 30 miles as the crow flies from her Lake George Home. You can see THOSE mountains from the cliff/ledge right behind my house. I feel very connected to her. But it's SO true that her fame and notoriety were very much cleverly spurred by Stieglitz. Very cleverly. Liza- Thanks for your kind words. That's a shame about the mountains in NM burning. Oddly the Group of Seven painters (the Canadian artists who I feel a kinship with) did some of their best work in the burned out hills surrounding Lake Superior in the early years of the last century. And what a great story about you being able to see those same Lake George Mts.! Sarah, thanks so much for your comment. I still remember when I first saw O'Keeffe work- sort of like a very pleasurable jolt of strong coffee. And she usually holds up beautifully over time.